If Beresheet succeeds, Israel will join an exclusive moon-landing club. 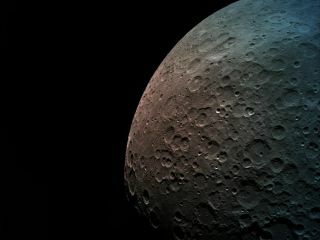 Israel's Beresheet lunar lander captured this view of the moon in early April from a distance of 341 miles (550 kilometers). If Beresheet succeeds, Israel will become just the fourth nation to land a spacecraft softly on the moon, following the Soviet Union, the United States and China. Beresheet is currently orbiting the moon and remains on an "excellent" track, said its operators, the nonprofit group SpaceIL and the company Israel Aerospace Industries (IAI). On Monday morning (April 8), the craft performed an engine burn to tighten its path around Earth's nearest neighbor. Over the next few days, additional maneuvers will turn the spacecraft's current elliptic orbit into a circular orbit 125 miles (200 kilometers) away from the lunar surface. From that path, Beresheet will then make its way down to the surface. The lander will touch down within Mare Serenitatis, on the northern hemisphere of the moon's near side. The target region is located in the northeastern part of Mare Serenitatis, west of the main Posidonius Crater. This area harbors three possible landing sites: a primary site and two backups. In addition to a suite of cameras, the mission has integrated a scientific payload consisting of a small Lunar Retroreflector Array (LRA) provided by NASA's Goddard Space Flight Center, said team member Oded Aharonson, of the Weizmann Institute of Science in Israel. Beresheet also has a magnetometer, provided by the University of California, Los Angeles, which will explore the region's magnetic anomalies. The projected landing area on the moon by Israel’s Beresheet spacecraft. In a paper presented at the 50th Lunar and Planetary Science Conference (LPSC) last month, Aharonson and his colleagues spotlighted Beresheet's science mission. It will consist of detailed characterization of the landing site, measurement of crustal magnetic anomalies to narrow down their possible origin and the longevity of the lunar dynamo, and localization of the lander using ranging via the LRA. "We plan to use these data to associate the anomalies with geologic features on the surface and thus probe the genesis of the remnant magnetization," the LPSC paper explained. "A relation between magnetization and local wrinkle ridges would be consistent with the hypothesis that the Serenitatis mare are uniformly magnetized with an intensity higher than typical Apollo mare basalts but only producing surface fields at physical breaks where the field lines can emerge due to edge effects." The LRA, which is smaller than a computer mouse, is a technology demonstration that could enable more-precise landings on the moon and other celestial bodies in the future, mission team members have said.